The Nintendo 3DS has amassed a considerable RPG library over the course of its lifetime. While the system has reached its twilight years, there are still a handful of notable titles heading to the system, especially from the developers at Atlus. Etrian Odyssey has made its home on Nintendo's two-screen handhelds, and Etrian Odyssey V: Beyond the Myth is the latest entry in the dungeon crawling franchise. 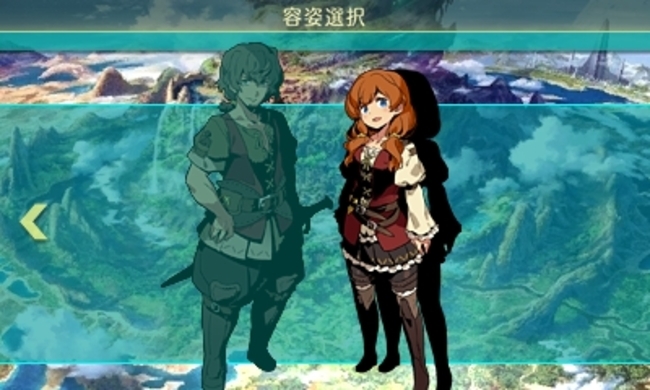 More recent Etrian Odyssey games have been 'Untold' remakes of earlier entries, featuring newly added story modes and a set cast of characters. Etrian Odyssey V - being a mainline numbered entry - goes back to the pure class-based dungeon crawling at the heart of the series. 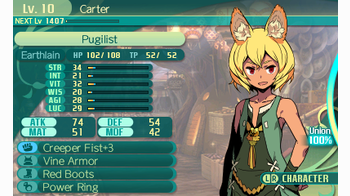 The very first thing you'll encounter in Etrian Odyssey V is the expanded unit creation system. Not only are there ten classes to choose from, but there are now four separate races in the mix as well. You have Earthlains, Celestrians, Therians, and Brouni, which are essentially equivalent to humans, beast-people, elves, and halflings, respectively. At the game's onset, every race is exclusively tied to classes they are allowed to be - only Therians can be a Warlock, for example - but eventually this opens up a bit, allowing any race to wield any class. They also have different stat distributions, so selecting particular races can be another element for fine-tuning your group if you choose. The game now offers far more customization options when it comes to creating your units. In addition to the usual four portraits per class to choose from, you can now individually change their hair color, eye color, skin color, and even the voice type for each portrait. Hair and eyes each have a primary and secondary shade that the player needs to select, so you can set numerous permutations of color combinations in creating unique characters for your team. None of this will affect gameplay directly, but it's a neat addition that adds some more personalization to the experience. The lion's share of gameplay in Etrian Odyssey V will feel especially familiar if you have played previous entries in the series. After creating your team, you are tasked to explore each level of the Yggdrasil to learn about the mysteries within. You then traverse floors of this maze in a first-person, step-by-step fashion. Combat is initiated once an encounter meter fills on the screen, and then battles are carried out in a round-based manner. 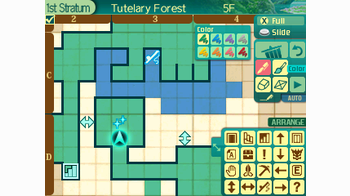 Along the way, the player fills in the map of the labyrinth that is displayed on the bottom screen of the 3DS system. You can undertake quests that require the player to collect certain parts from monsters, visit certain sections of the labyrinth, or defeat special monsters. Loot can be sold to the shop for money while also unlocking new equipment to purchase. 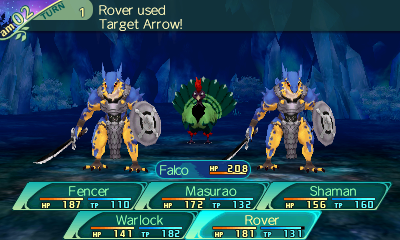 For the most part, Etrian Odyssey V is the class-based dungeon crawler you would expect it to be. Party coordination is as important as always, and knowing how to organize your units so that their skills complement each other well is the key to finding success in combat. I've always been drawn to this genre because of how much agency they give the player in constructing their team, and EOV does not disappoint here. It also retains some of the quality of life enhancements found in the Untold remakes, such as vastly improved traversal speed and snappier battle pace, which is undoubtedly a plus. While the base gameplay style here is largely the same, a few mechanical changes are present. First of all, out-of-dungeon exploration - like airship sailing in Etrian Odyssey IV - has been completely removed. Beyond the Myth returns to a more straightforward singular massive dungeon like the first three games in the series, rather than using smaller dungeons spread out on a world map. In addition, the way geomagnetic poles work has been notably altered. Instead of acting as entry points to the labyrinth, they now only act as exit portals to return to town. A floor jump system has been implemented, where the player maps out a floor and registers that map to the town council. If the floor map is sufficiently filled out, you can then enter the labyrinth on that floor (rather than starting at the very bottom), ultimately allowing you to jump straight to any floor. This is a bit more lenient than previous titles, where you could only enter on roughly every fifth floor. It certainly makes backtracking a bit more convenient and is certainly a worthwhile endeavor to diligently fill out your maps. Changes like these help to remove just a bit of the tedium, allowing players to more easily revisit floors to fight monsters, gather materials, or take on sidequests. Combined with the quickened battle and travel pace, Etrian Odyssey V turns out to be one of the more player-friendly games in the series. Class progression has also been adjusted. 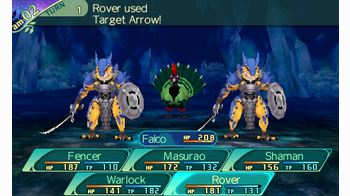 Previous games eventually introduced a multiclassing system where a sub-class could be selected for each unit, allowing them to use abilities from two classes at once. 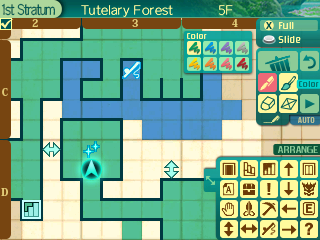 Etrian Odyssey V goes for something different by offering a branching-path progression system instead. Once a unit meets a certain level, you can then promote the unit to a "Mastery" class. Each base unit has two Masteries to choose from that hold a different set of skills. A Fencer can promote to a Phantom Duelist - a unit that specializes in swift attacks and dodging enemies, or they can promote to a Chain Duelist - a unit that uses followup skills for multiple hits on a foe. Dragoons can promote into Shield Bearers or Cannon Bearers, and so on. It is up to the player to make this decision based on their party composition and their approach to combat. It's difficult to say if this new class promotion system is better or worse than the multi-classing systems used in previous games, but it still allows for a good amount of player input in constructing their party while offering something a little different. Players can always use the Retire system in order to generate new units if they ever want to alter their team, so there is enough flexibility allowed so that no decision has to be permanent. Different races also have Race Skills they can learn that come in a few varieties. There are passive skills unique to each race that can affect their resistance to various types of attacks. There are also a few skills that can play a minor non-battle role while in the labyrinth. Another type of Race skill you can learn is known as Union Skills, which are combination skills that require multiple party members to use. 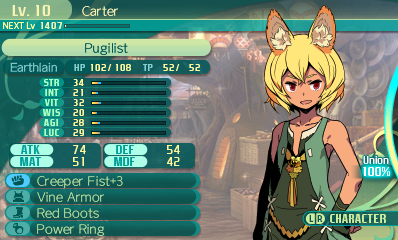 For Etrian Odyssey veterans, Etrian Odyssey V's Union skills will most resemble Limit skills in Etrian Odyssey III. Each character has a Union gauge that slowly fills during battle, and when the gauge is full, that unit can perform a Union skill with other members of the party. Different Union skills have a variety of members required to use, with the most powerful skills requiring all five members. There is a variety of skill types available, such as preventing damage for a turn or performing a powerful offensive move. As for those labyrinth skills, Etrian Odyssey V includes an Adventurer's Log system which comes into play as you explore. At various points along the way, you are sometimes given an option to choose from, such as whether you want to climb a tree to gather food. Depending on your choice and what Race skills you have in your party, you can gain experience from these little miniquests scattered throughout. These don't have a large impact on the game as a whole, but it's always worth exploring around to see how many of events you can clear and gain some EXP along the way. None of these small tweaks in gameplay drastically change the formula, but it allows Etrian Odyssey V to feel fresh even when the core structure remains unchanged. The in-game difficulty options have also been changed, slightly. 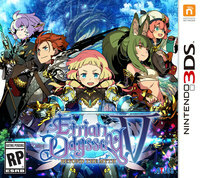 Etrian Odyssey IV had options for Normal or Casual, while both Untold games had three choices. Etrian Odyssey V's difficulty levels are categorized as Basic and Advanced, and I started with Basic, just to try it out. After completing the first two Stratums on Basic, I felt my progress was a little too smooth-sailing. I bumped up to Advanced for the remainder of the game, which felt more akin to the Normal difficulty I was familiar with in previous titles. Those who have a history with the series may want to start on Advanced. Luckily, the game allows the player to change difficulty at will. Etrian Odyssey games are not especially story driven, and this entry is no different. At the game's onset, the city council of Iorys calls for adventurers to explore the mysterious Yggdrasil tree. Guilds from all across the land of Arcania answer the call and suit up to tackle the labyrinth. Along the way, players will meet the Lili the Necromancer and Solor the Harbinger, who have their own reasons to entering Yggdrasil. While there is a basic story premise given and some light character interaction throughout, it's never the focal point. In fact, narrative elements are less prominent here than they were in Etrian Odyssey IV. Everything is quick and to-the-point, so those hoping that Etrian Odyssey might start to be more plot-driven may be disappointed. Etrian Odyssey V knows what it does well and sticks to it. There are enough small changes from previous entries to give the game its own flavor, but it's not going to reinvent the core framework that makes the series tick. Fans will definitely want to check out this latest entry, and quality-of-life improvements make the game accessible to newcomers as well.